The founding members of the Board of Trustees designed the College Seal, which is in keeping with the TOCC Vision, Mission and Goals. Tony Johnson, a local artist, was commissioned to develop the College Seal. The top left picture depicts Baboquivari, the sacred mountain of the O’odham, which according to O’odham belief is the birthplace and the beginning of the O’odham. The top right picture depicts the O’odham in the natural environment that supplied the basic necessities for healthy living (e.g., the cactus for sustenance and shelter). The olla, held by the woman in traditional dress, was a vital utensil for survival in the desert. The handmade olla was generally used for winter storage. The handmade gourd-musical instrument held by the man signifies the spiritual and artistic aspect of the O’odham. This instrument is used to accompany the ceremonial rituals, songs and orations of the O’odham. The circle depicts the cycle of life. The people, with joined hands, demonstrate the interrelation and interdependence human beings have with each other. The circle also symbolizes the traditional round dance of the O’odham. 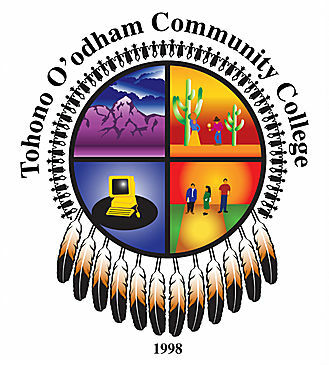 The eagle feathers represent the political districts of the Tohono O’odham Nation. The bottom left picture depicts the future educational process of the O’odham through the use of technology. The bottom right picture depicts O’odham students who are prepared to continue the learning process through the Nation’s institute of higher education. The four parts of the circle symbolize the four sacred directions of East, West, North and South. The four sacred directions give spiritual assistance and gifts of natural elements.